This very attractive hand carved charm from the Qing dynasty (清朝 1644-1912) was sold at a China Guardian auction in Beijing in 2013. 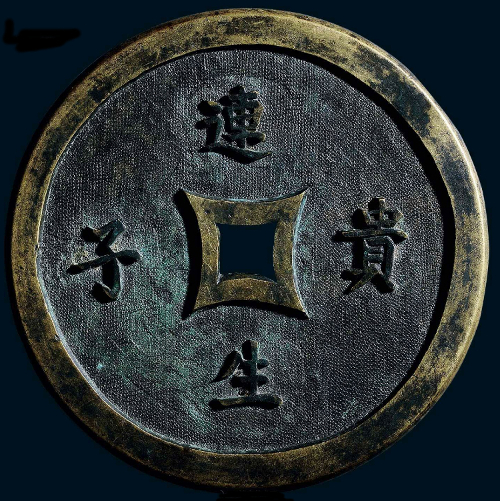 The inscription on the obverse side of the charm (shown above) reads lian sheng gui zi (连生贵子) which translates as “May there be the birth of one honorable son after another”. Sons were highly desired in a marriage because they carried on the family line and were responsible for performing the ancestor worship rituals. The ideal Confucian family was considered to have five sons and two daughters. 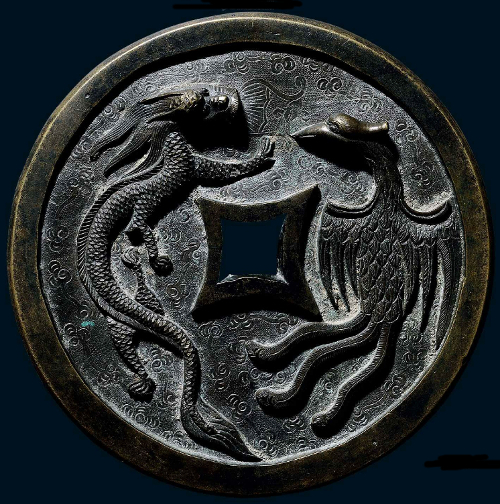 The reverse side (shown above) has a dragon (long 龙) on the left and a phoenix (feng huang 凤凰) on the right. Both are depicted in great detail in high relief. The dragon represents the male or yang (阳) force while the phoenix represents the female or yin (阴) force. Yin and yang are the two complementary principles of the Chinese universe. A dragon and phoenix paired together represent a married couple and is a traditional Chinese wedding motif. This beautiful charm has a diameter of 13.6 cm and sold at the auction for $5,418 (RMB 34,500).